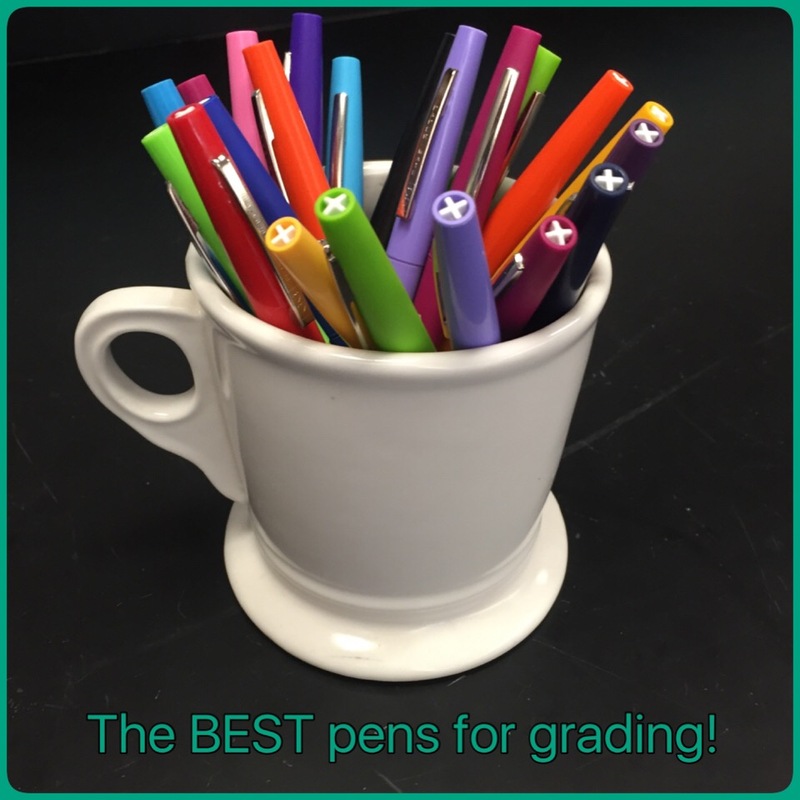 #2: Amazing pens for grading. Grading is tedious. Grading takes forever. Grading is… part of the job and we need to find ways to take the sting out of it! Personally, I hate when the ink doesn’t flow well or it smears (I don’t have time to wait for this to dry!). The day I discovered these pens, my life changed. Paper mate flair. These pens are wonderful because they come in a variety of colors (I despise grading with red pens), they dry instantly and quite frankly, the colors make me happy! 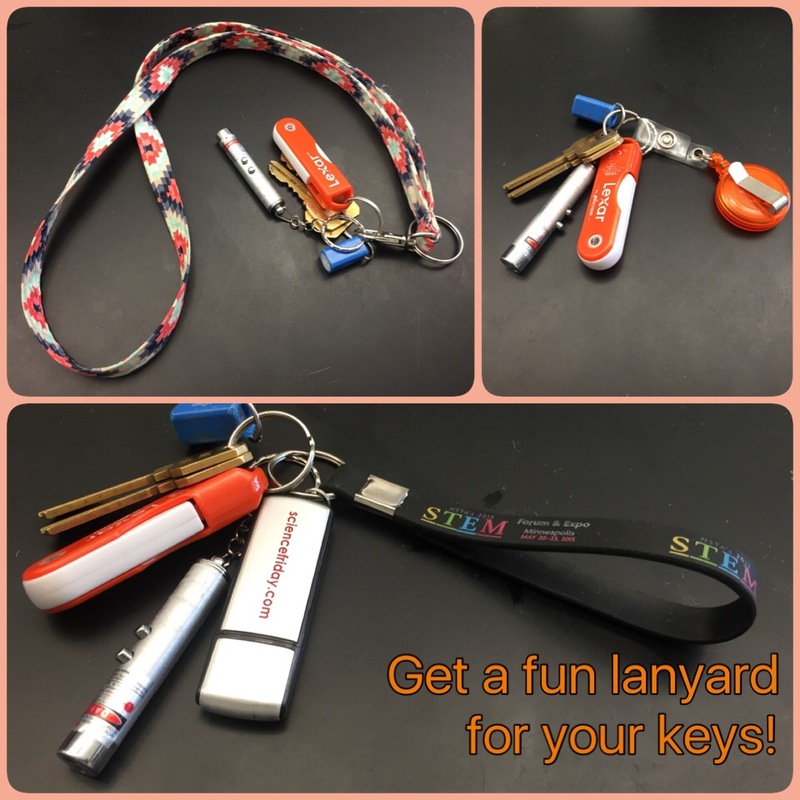 #3: A cool key chain or lanyard for your school keys. I like lanyards because they make your keys harder to lose. The problem is that most school issued lanyards are pretty unnatractive. It can also be difficult to find cool keychains (for those who are not it into lanyards). When teaching, we generally have to have our keys on us at all times, so let’s make it easier to carry them with us. Here are four types I think are most helpful. Lanyard, wristlet and, stretch band and badge pull. I just ordered this lanyard from a great shop on Etsy and I am really pleased with it. Good quality, and fashionable! 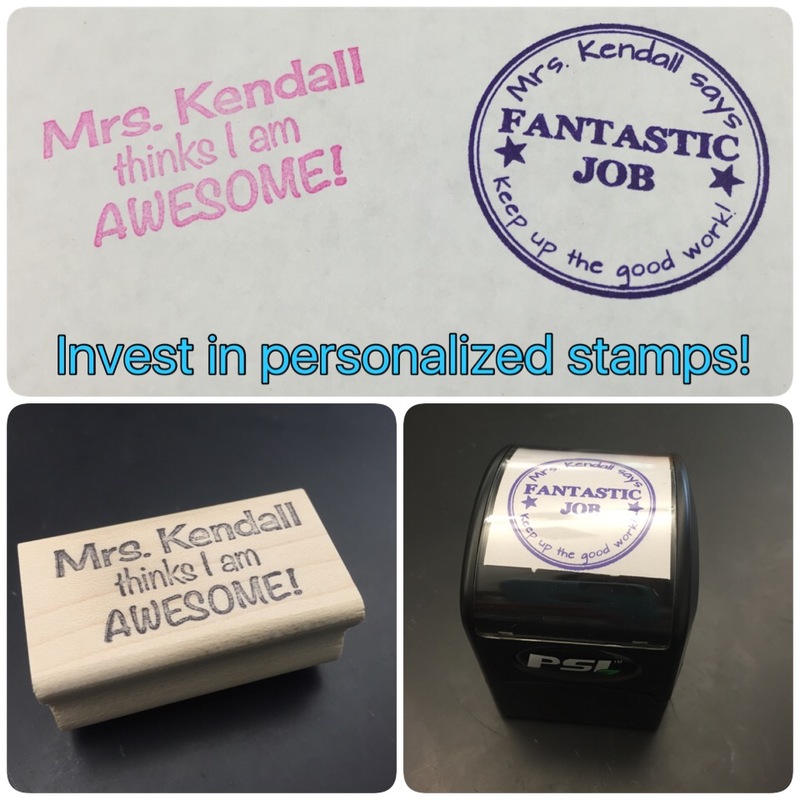 #4: Personalized stamps. I’ve never met a teacher who doesn’t like a good stamp. I usually have good luck with the dollar section at target before the school year starts (they always have good teacher-stuff there). However, recently, I have discovered some truly awesome personalized stamps! I found two that I loved on Etsy, one rubber stamp and one self inking stamp. Then there is the seriously cool stamps made by these guys. I had a guest teacher who had one of these and my students thought was the absolute coolest thing ever! I’ve bee wanting one ever since! #5: A great coffe (or tea) mug. How else do we get through the long days of teaching and the even longer nights and weekends of grading but with caffeine!! If you are going to continuously sip on the sweet nectar of the bean (or leaf), you might as well sip in style! I have a smattering of silly and inspiring teacher mugs. 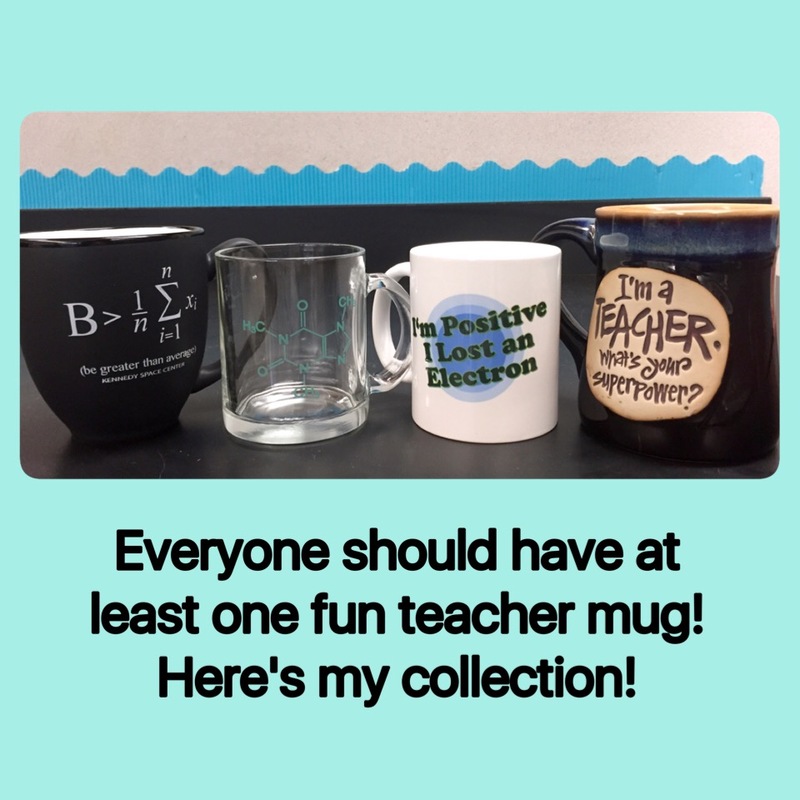 Some have science puns, others have formulas, some have images that disappeare or reappeare with hot liquid added, and then there are the sweet mugs with inspirational messages about teaching. I love them all for different reasons and drink from them based on my mood or the unit I’m teaching at the moment. #6: An inspirational book about teaching to crack open on difficult days, weeks and years. I am a huge proponent of inspirational messages and stories. I have a deck of inspirational cards in a decorative holder on my desk where I can cycle out the cards and messages based on my moon or my needs. 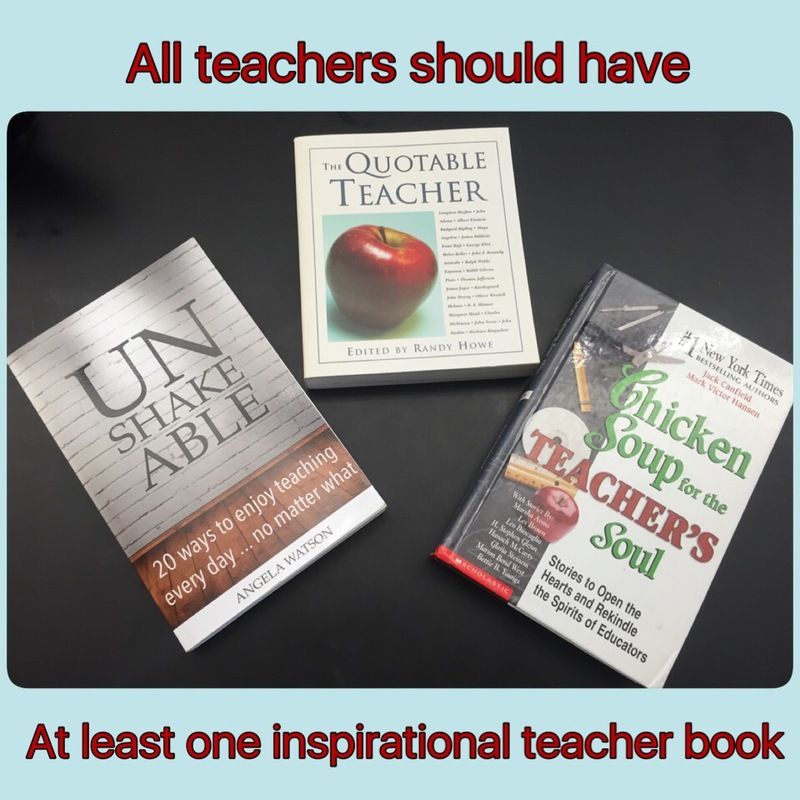 I also own several copies of chicken soup for the teachers soul–a digital copy on my nook, a hard copy at home and a hard copy in my classroom along with other inspiring books. This way, an inspirational pick-me-up is always there when I need it. 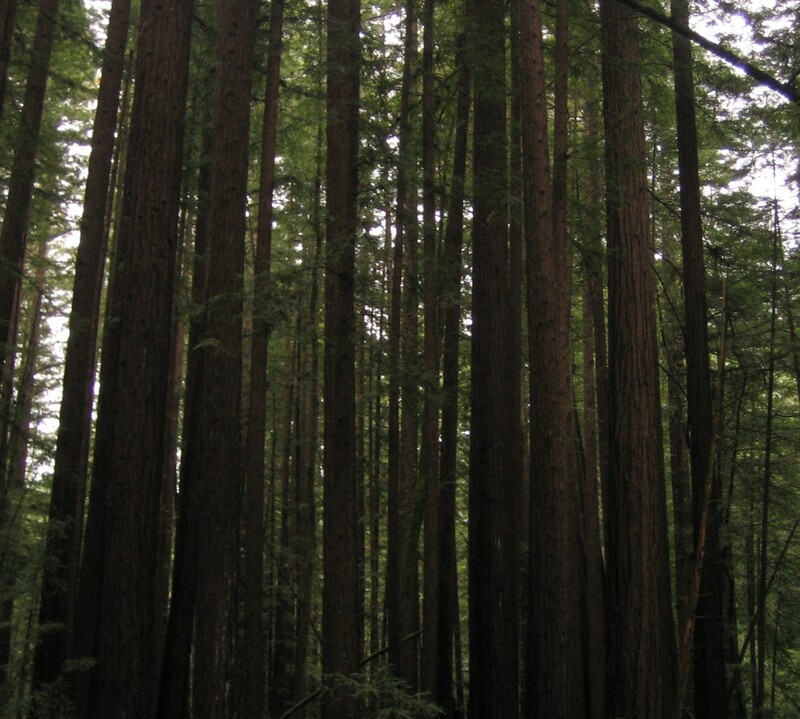 For more inspiration and self care tips, check out this blog post I wrote. 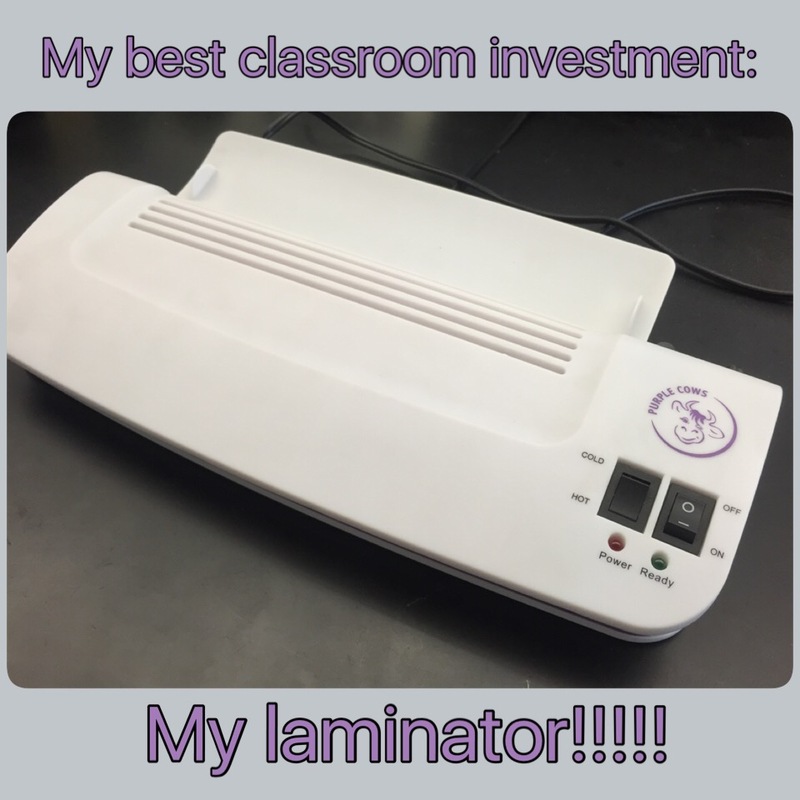 #7: A personal laminator. At first, I bought this laminator on a whim. It was super cheap at Costco and I figured “hey, I have a couple of small posters I need to laminate, it’s worth the 20 bucks. I’m sure I’ll use it a few times”. Best twenty bucks I’ve spent on my classroom. It’s the gift that keeps on giving! I have laminated SO much over the last few years, I have had to buy multiple packages of replacement laminating sheets so I could laminate MORE stuff! I’m practically an addict! How could I not use it on everything! 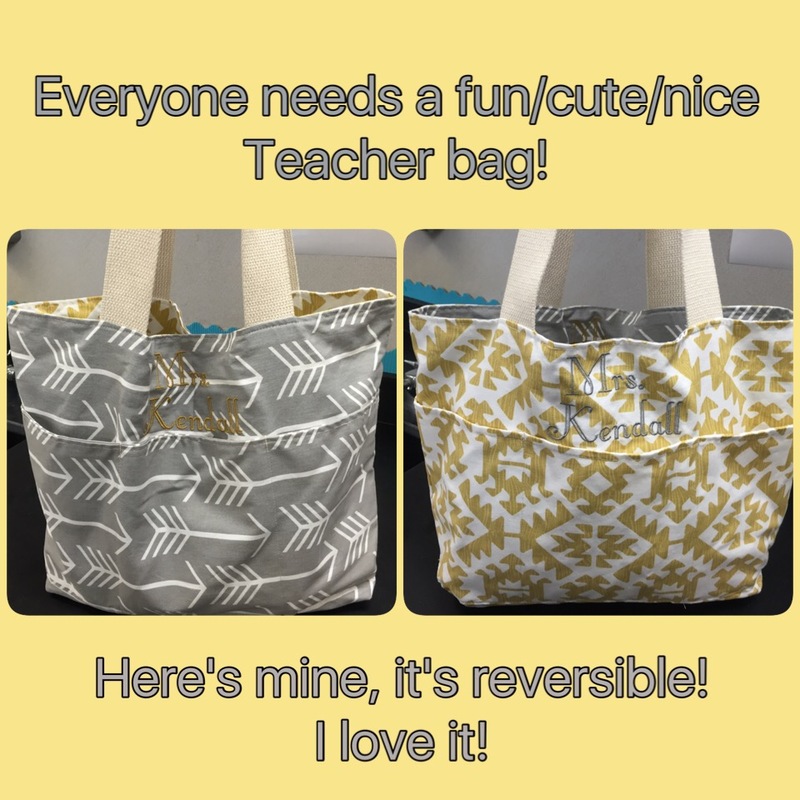 It instantly makes things nearly indestructible to the every-day wear and tear of students! The first year I got it, I printed out a class set of periodic tables and laminated them. I have used them every year since. It’s been 4 years!!!!!!! They are all still in perfect condition!! I have also used them for station signs, review cards for games (like the snowman game I mentioned in this post), signs in my classroom, bathroom passes, job descriptions for group work; you name it, I’ve probably laminated some iteration of it! 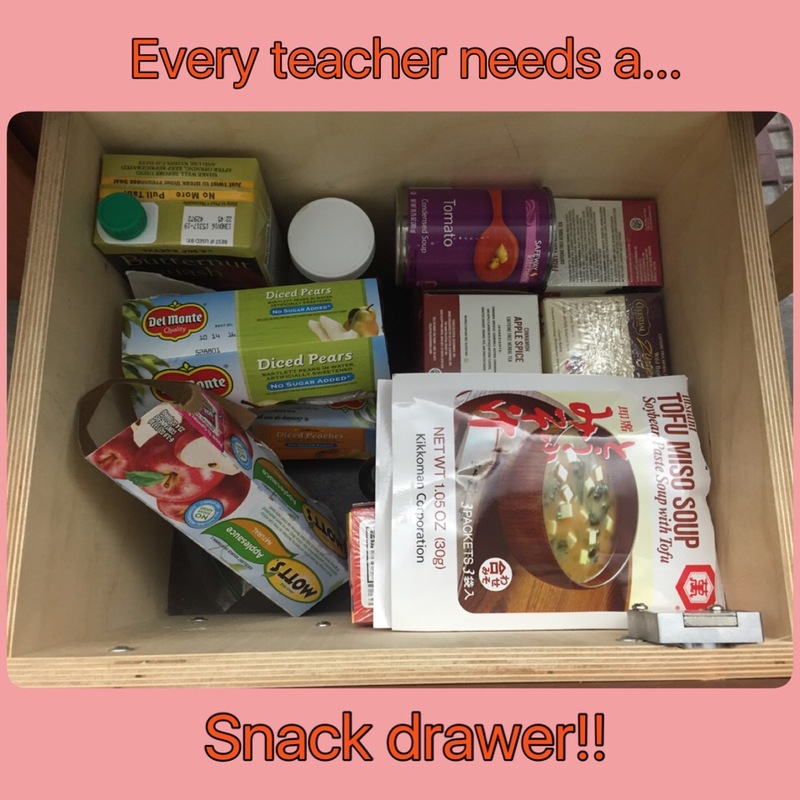 #8: A snack drawer in your classroom. I learned this from my amazing master teacher. At first I thought it was a bit unconventional. Just bring a lunch! Within that first day of teaching, I realized how great it was. We often stay at work late, unplanned and need extra sustenance on especially trying days. Or, we have to run out of the house early and can’t make a proper lunch. Perhaps a student is in your room after school and you can tell they are hungry. My snack drawer has come to my rescue many times and I am very grateful for it! 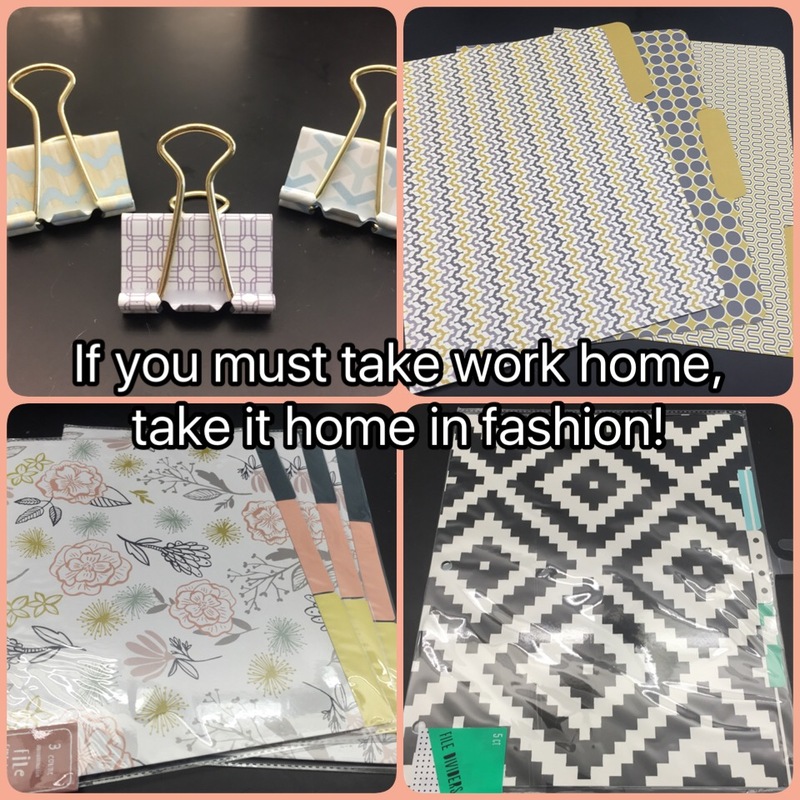 #9: Nice folders and binder clips. Similar to the need to have a nice bag for carrying your work, I think that having nice folders and binder clips also makes the tedious task of grading a little more bearable. I grab new folders every time I see them on sale at the store. #10: Room refresher spray. 7 hours. 1 room. 150 teenagers. 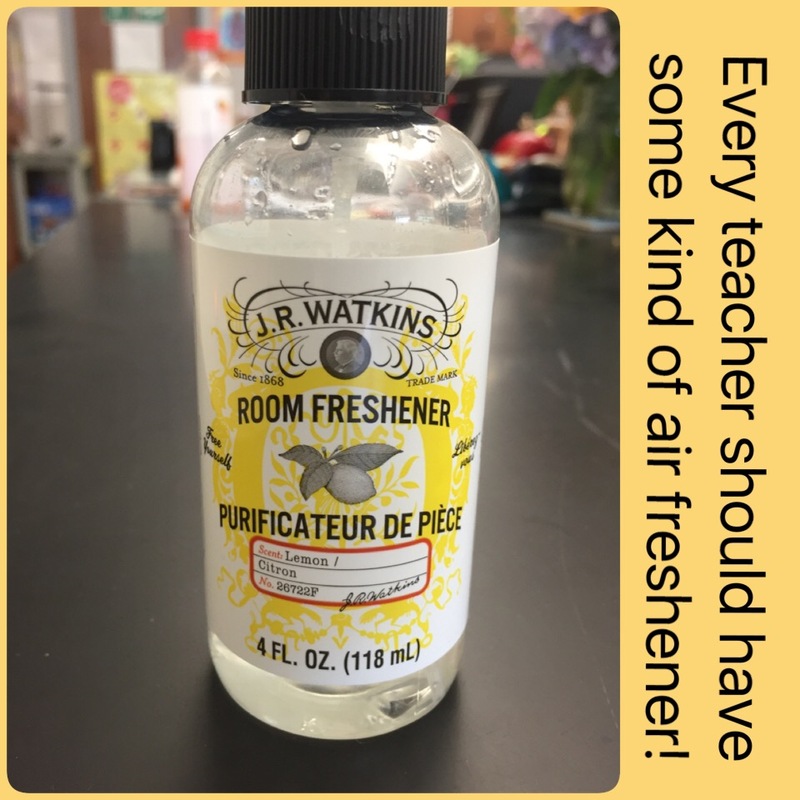 As I’m sure you can imagine, my classroom begins to smell less than pleasant by the end of the day. I have found that a nice reed diffuser or a natural room spray can do wonders. Be sure to take allergies and sensitivity into consideration, strong smells and chemicals can sometimes set off asthma(this is why I tend to use the natural stuff). Is there something that you enjoy and can’t live without in your classroom? Share it in the comments section below! I am looking to purchase the weights you show on the STEM activity od newspaper tower. Do you know where I can purchase these? I have searched the internet but I can’t find anything reasonable and that is about a 1 lb weight. Thank you! Hi Mary, I think your best bet would be a science supply company. I would try: Carolina, Fisher, Nasco, Frey or Ward. They don’t necessarily have to be 1 lb weights; really, as long as they have a hook from which to hang you should be fine. I wish I could be of more help, but the weights I had were left behind by the previous teacher. Good luck to you! I hope you find something you can use and that your students enjoy this activity as much as mine did!